In the heart of the old city of Jaipur, is the former royal resident built in a blend of the Rajasthan and Mughal styles. The curved arches are supported by grey – white marble columns ornate with floral motifs in gold and coloured stones. The main entrance is through the triple arched gate, the ‘Tripolia’ with eight marbles porticos and two curved elephants in marble guard the entrance. The palace houses a museum with a super collection of Rajasthani costumes and armoury of Mughal and Rajputs including swords of different shape and sizes with chased handle. The palace also has an art gallery with an excellent collection of miniature paintings, carpets, royal paraphernalia and astronomical works in Arabic, Persian, Latin and Sanskrit. The ‘Mor Chowk’ known for its exquisite peacock mosaics in glass and the ‘Chini Chitra Shala’ noted for its blue and white ceramics are other attraction in the palace. 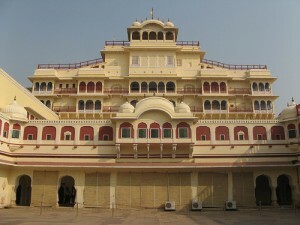 This entry was posted in City Palace, Rajasthan and tagged city palace jaipur, city palace of jaipur, india palace, Palace, palace jaipur, the city palace. Bookmark the permalink.